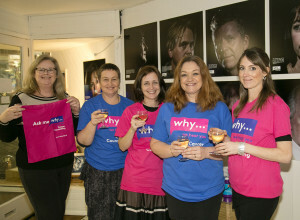 LOCAL counselling charity Positive Action on Cancer (PAC) launched its rebranded service last week, and will now be known as We Hear You… Cancer Counselling (WHY). The charity, which turned 21 years old last year, is hoping the new brand will help it spread outside of Frome and be able to increase the range of services it provides. The new brand is designed to state more clearly what the organisation does and make it known that We Hear You is the place to go for emotional support. Fundraising and communications manager Hannah Culff said, “This is a huge change both for us and for the local community, but it is one we are incredibly excited about. We have worked tirelessly to find the correct new look and feel for the organisation that we all care so much about. “Positive Action on Cancer as a name does not quickly convey what the organisation does and in recent years, as the number of cancer charities grow, the name PAC has increasingly become a barrier to reaching more clients and supporters. “With referral rates at an all-time high and with more people needing the service, it is vital that the charity is attracting more supporters. PAC needed to refresh its brand to help it become more visible. Starting out as a telephone helpline for women affected by breast cancer, We Hear You has developed and grown into a respected charity providing a professional and free service to its clients. Hannah continued, “PAC was a brand well known and loved in Frome, but despite hard work it had very little recognition outside its home town and the organisation is struggling to reach new communities who may need the service. “When surveyed, those unfamiliar to the charity assumed that it was either a cancer research organisation or one trying to overcome cancer, rather than an organisation providing emotional support to those affected by cancer and other life threatening conditions. Compugraphic in Frome and Bulk Solutions in Melksham have also donated their services to the charity during the rebranding, enabling it to be done for free. To launch the new brand and to help raise awareness of the emotional impact of cancer We Hear You is currently holding an exhibition of photos taken of people affected by cancer in the Good Gallery, Frome.